A little over a week ago, I jetted off to one of my favorite places in the world, Puerto Vallarta. Being only a short 2 hour & 15 minute flight from Houston, it’s a no-brainer when we locals want a tropical vacation without having to spend a ton of time traveling. 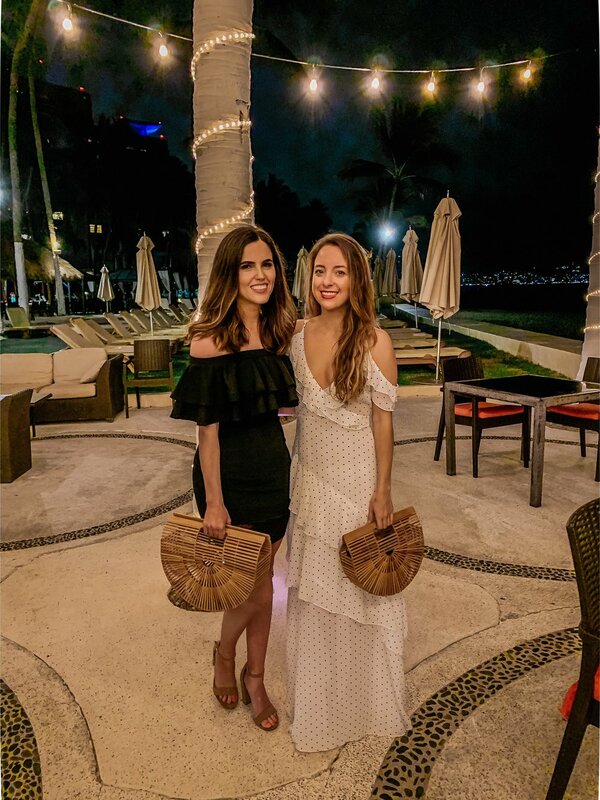 I went to Puerto Vallarta exactly two years prior with my friend Shelbi and stayed at The Westin Resort & Spa, and was so excited to have the opportunity to partner with the hotel again this year. The trip came at the perfect time, honestly, because this mama needed a little break. Don’t get me wrong, I love my boys. I live to spend time with them. But with almost 13 months of nursing Boonester throughout the night and never once having a solid night’s sleep in over a year, my body desperately needed a rest. And there’s no better place to get that than The Westin in Puerto Vallarta. I’m going to explain some of what I did there, why I love PV so much, and all about the hotel in case you’re interested in vacationing to this tropical paradise. 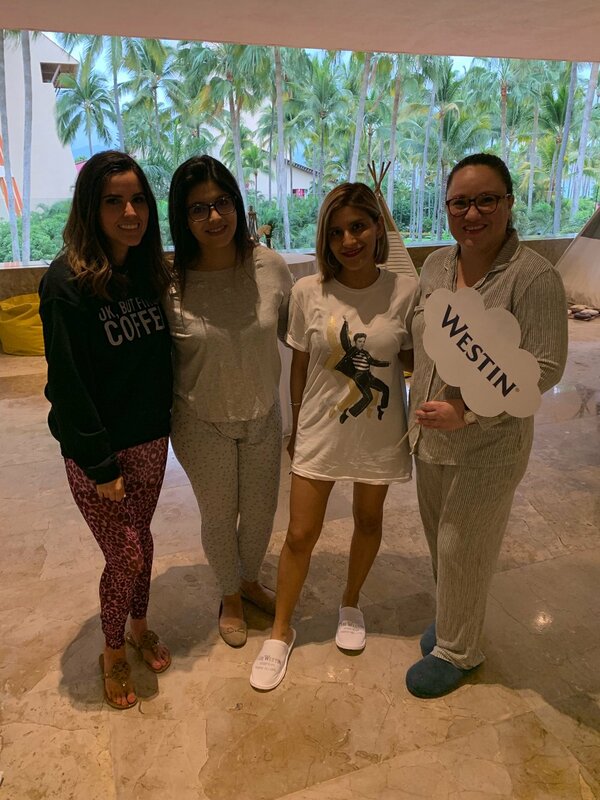 A big reason why I partnered with The Westin was because the day I arrived there, March 15th, was their “Sleep Well” day. The Westin motto is “Eat well, sleep well, be well” and the hotel prides itself on promoting well-being for each and every guest. “JOMO” was the overall theme of Sleep Well Day, meaning “joy of missing out” instead of the popular “fear of missing out” acronym. This encouraged guests to relax, unwind, and find joy in taking time to rest. This is a mantra I can certainly get behind, and I love that The Westin puts so much focus on health and wellness. When I arrived Friday evening, there was a big Sleep Well event happening in the lobby area. I got to do an incredible meditation class, meet some of the sweetest local bloggers, reunite with friends from 2 years ago (that have kept in touch all this time! ), eat delicious food prepared there at the hotel by one of the chefs, and just chill (something I rarely do anymore!). After the event, the bloggers all headed to dinner at Arrecifes Seafood & Steakhouse, arguably my favorite restaurant ever. In a weak attempt to explain the ambiance to you, the restaurant is settled right on the Pacific, with the waves crashing in beside you, lights of the city glistening on the bay, and shadows of mountains standing tall in the distance. Beautiful acoustic live music fills the air Wednesday-Saturday evenings, and you can often catch a firework show over the ocean right above you. It’s an atmosphere I truly can’t begin to do justice with words, and I haven’t even gotten to the food! More on that later. Saturday morning called for room service in bed (The Westin has the most delicious waffles!) followed by a massage at the Spa with another local blogger, Dulce of She Petite Blog. I am being completely honest when I tell y’all that I’ve had the two best massages of my life at the Spa at The Westin in Puerto Vallarta. I know there are other options in the city, but there’s like strolling downstairs at your hotel, getting the most incredible hour-long massage, hitting up the sauna for a bit, and then lounging by the pool the rest of the afternoon. I don’t know where they train these masseuse at The Westin but….they’re so talented at what they do and I left the Spa feeling so calm and recharged. The pools at The Westin Puerto Vallarta are absolutely out of this world. We’re talking swim-up bar, crystal blue water that’s the perfect refreshing yet not cold temperature, hot tub if that’s your thing, stand-alone beds in the pool for sunbathing, and so much more. I could live there…and basically did for the weekend. Saturday evening was spent back at Arrecife Seafood & Steakhouse with my friend Nicole. It was so wonderful getting to know her over the weekend, as we’ve followed each other on Instagram for awhile and already felt we were friends. Dinner that night was amazing- the seafood at Arrecife is so fresh, likely caught day-of, and prepared in the most delicious and beautiful way. 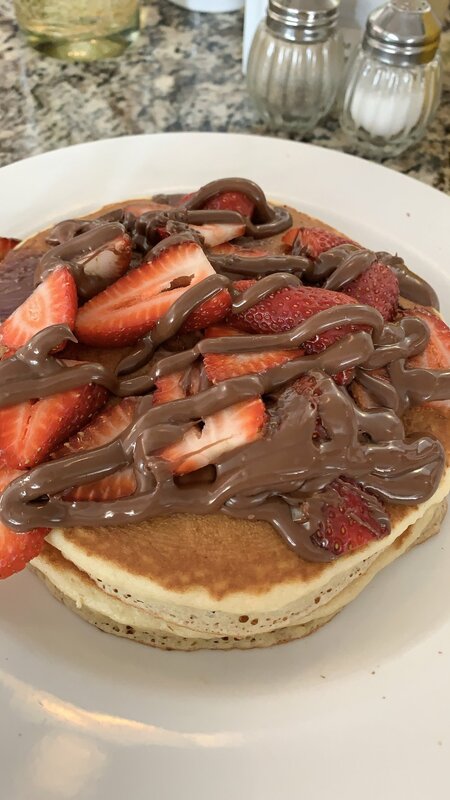 I also love the chocolate volcano at Arrecife- it’s a must! Easy breezy style for afternoons by the ocean with friends. The Westin is nestled on 16 acres of oceanfront property, so you can imagine all the exploring there is to do while you’re there. And in case you’ve explored all 16 acres and want to see more of the city, you’re in luck. 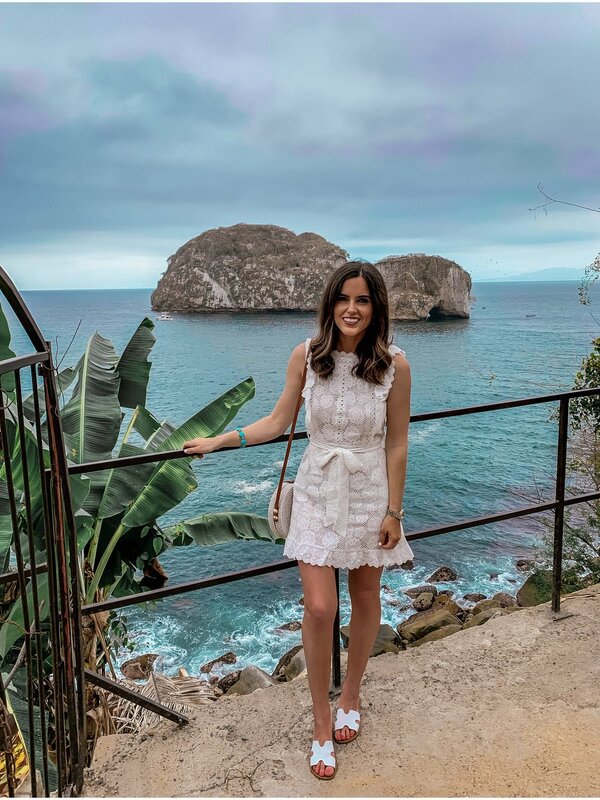 The Westin is located conveniently right down the street from the Marina, which is another gorgeous area of PV full of quaint little shops, cutest dining options, and a breathtaking view of boats resting on the water. Most days you can catch a view of an alligator swimming by (saw one over 7 ft. long this trip!) and iguanas sunbathing on the rocks. Definitely worth the walk over and great for souvenir shopping. Sunday evening consisted of dinner at another one of The Westin’s fine dining establishments, El Palmar. I opted for salmon yet again (it’s just too good there) and had the most mouth watering appetizer of roasted and boiled corn. No secret I “slept well” that night. If you’re wanting to venture out a little farther than the Marina and see more of PV, I definitely recommend doing so. The city is stunning everywhere you look, nestled on the bluest bay surrounded by mountains. Take a drive over to Los Arcos and you’ll truly feel like one of the locals, immersed in nature. Don't forget to wear a swimsuit as endless inviting beaches will be calling your name along the way. I had to spend my last morning soaking up the sun by the pool, and had the place basically to myself. Birds chirping in the distance, sounds of the ocean rolling in behind me, watching ships sail out into the vast blue water. Truly a slice of heaven on earth. My stay was so amazing and I loved meeting new friends, re-uniting with old ones, and getting some much needed R&R. I was ready to return home to my boys and it was so sweet seeing their smiling faces waiting for me at the airport. I can’t begin to tell you how much I love staying at The Westin Resort and Spa, Puerto Vallarta. While I have worked with them, every word of my review has been honest and I even feel I’ve held back some (if that tells you anything). A question I’ve gotten quite a bit is whether or not the resort is all-inclusive and it is not. But in my opinion, it’s still a great deal. Rooms average around $120 per night and the restaurants are affordable yet world-class, so I feel it’s comparative to what you’d spend at an all-inclusive. I also think it’s important to see some of the city, as Puerto Vallarta is safe and there’s so much to do outside the walls of your hotel. The Westin is located 5 minutes from the airport and can easily send transportation to and from the hotel for your arrival and departure. Just don’t think too much about your departure, as you’ll never want to leave this beautiful place. To my friends at The Westin Puerto Vallarta, thank you again for another dream vacation. I hope to be back very soon, and next time with the boys!